441-DST is rated 3.9 out of 5 by 18. Rated 1 out of 5 by AmeliaM from Five Years and its Useless The faucet now leaks so much that I have to use rubber bands to hold it closed and it has loosened from the base connection as well. Total loss and not fixable at this point. 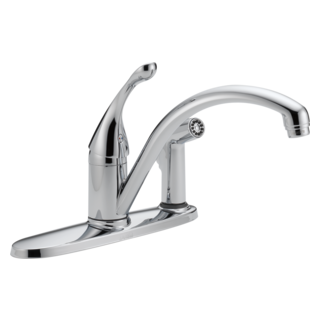 Looking into warranty, however I simply need a new faucet now. Rated 5 out of 5 by njmama from Almost Perfect Easy to install. Faucet handle is easy to move. I purchased the white model and the black ring on base of sprayer is wrong. 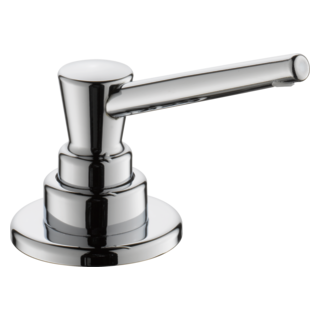 Rated 5 out of 5 by AmeliaM from Quality, simple faucet It works, and continues to work. Has been installed in our kitchen for over five years now, no problems, no concerns. Rated 1 out of 5 by Paul from A replacement faucet after nine years on the last one, and we did not have time to go through the Delta warranty time frame process. Great product, ease of purchase and shipping was super fast! Rated 4 out of 5 by Tom from A little drip I have had good luck with Delta in the past, but after installing this it dripped. I tried everything short of a new cartridge. After two weeks it seems to be dripping less. 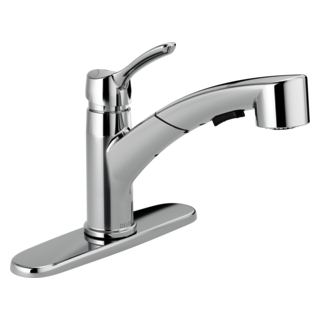 Rated 3 out of 5 by JV from Nice Faucet The faucet and soap dispenser arrived quickly and was easily installed. My only issue is that the water flow is slower than my old faucet and the sprayer makes a high-pitched sound. Otherwise, it works fine. 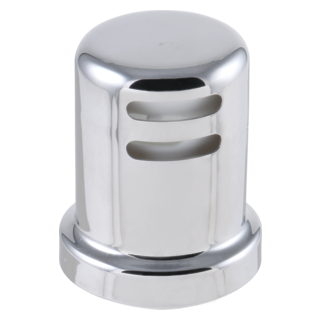 Rated 3 out of 5 by DaleC from Good product but occassionally leaks Good product but occassionally leaks if you don't bring the handle to the exact position with the proper amount of pressure....sometimes even with it. I wonder if the cartridge or the handle has to be changed/reset. Is this faucet compatible with a portable dishwasher? Thank you for your question. 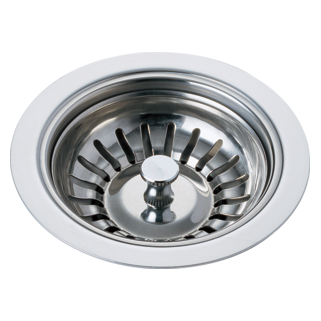 Delta Faucet model # 441-DST has an aerator that measures 15/16&quot; and if your dishwasher has the same measurement, it will work. 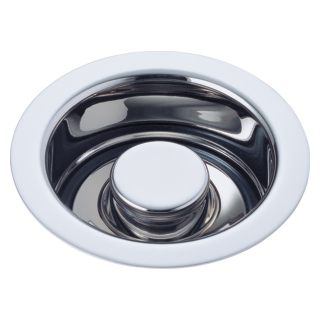 does collins 441-DST come with an escutchen plate to cover two extra holes in my sink base? What is the reach of the 441 DST (not the height) and can a Pur water filter be used with it? 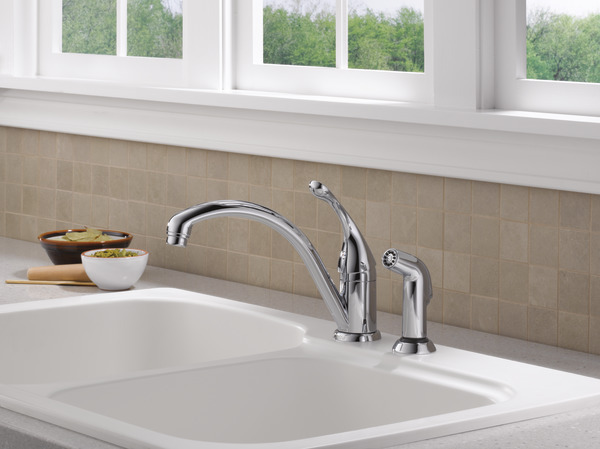 Does 441-SS-DST work with an undermount sink (no holes) and concrete countertop? On the Collins 441-SS-DST---is the HOUSING solid brass? And--- is the &quot;spout&quot; all metal or is it plastic with a metal overlay? How far does handle of faucet go back. &nbsp;There is a wall shelf behind this faucet and want to know faucet handle will not hit wall. 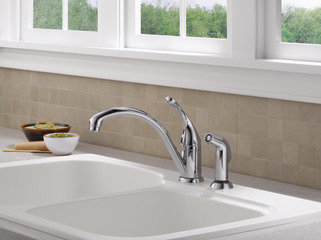 Does the #441 Kitchen faucet swivel? Thank you for your question. 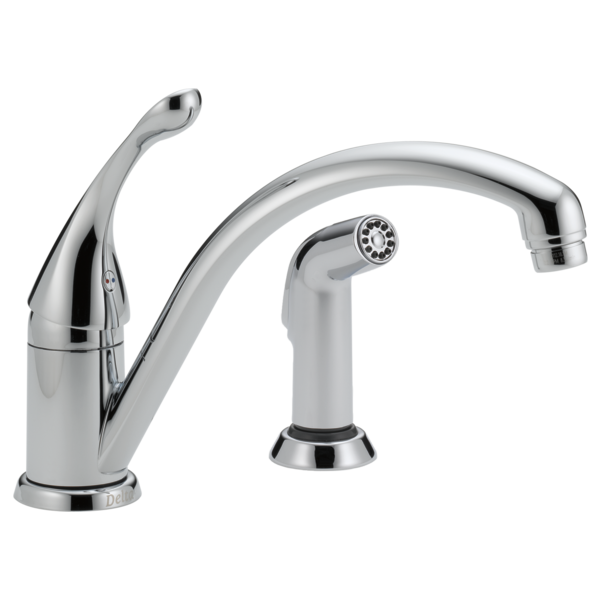 The spout on the Delta Faucet 441-DST series will swing 180 degrees.